I first wrote about Small St Espresso at the start of 2013, at which point it was at the centre of Bristol’s growing speciality coffee scene, which included (the now closed) Wild at Heart and (the yet to be opened) Full Court Press over on Broad Street. These days, the centre has expanded to include the likes of Playground Coffee and the newly-opened Tincan Coffee Co. Yes, that’s right, Small St Espresso has had an extension. Although this hasn’t increased the physical space that much, it’s almost doubled the (admittedly limited) seating, but fortunately without changing the essential character of the place which makes Small Street so special. Talking of expansion, Small St has also opened a second branch, the lovely Little Victories. You can read about the changes after the gallery. The result is a lovely new space, the alcove, accessed through a literal hole in the right-hand wall. Some effort has been made to smarten up the brick work, but essentially it does look as if someone knocked a hole in the wall. Which they did. There’s a new window at the front and the alcove, which is perhaps a third of the width of the original Small St, runs maybe two-thirds of the depth of Small St. Inside, the new right-hand wall is plastered, while there is a gorgeous brick-vaulted ceiling, with a central ceiling beam running from left-to-right separating two shallow arches. The alcove shares the same wooden floorboards as the main space, but is a little bit higher, accessible via a small step. The seating also matches that in the original body of the shop, with a bench running along the length of the right-hand wall. There’s a two-person table at the back and a larger, four-person table in the window at the front, both with their own benches against the party wall. Other than that, nothing much has changed, Small St retaining the same intimate character and excellent coffee that made it such a hit in the first place. It’s just now even more people can enjoy it at the same time. There’s a full write-up of Small St Espresso, including a complete gallery, in its main entry. You can see what I made of Small St Espresso in my original write-up from December 2012, as well as what I thought of it when I returned in April 2013. December 2017: Small St Espresso was a runner-up for the 2017 Best Physical Space Award. 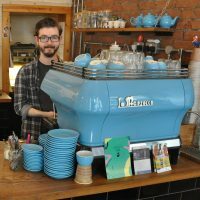 If you enjoyed this Coffee Spot, then take a look at the rest of Bristol’s speciality coffee scene with the Coffee Spot Guide to Bristol. This entry was posted in Bristol, Cake, Coffee Shops, Coffee Spot Updates, Laptop Friendly, Sandwiches by Brian Williams. Bookmark the permalink. What a great space! The more I read your posts the more I realise that I must spend some time in Bristol. The coffee scene there looks really exciting. Added to which some of the pictures you show Gibbs some great ideas on how to lay out a cafe. I love the idea they have of a water tap instead of a jug. I’m pleased to be able to continue to provide you with inspiration! And yes, you must visit Bristol! Have you ever reviewed water treatment options? No. Very much outside my scope/remit (if talking cafes).